40% of office workers say that work information is not easily accessible and data is difficult to share. Consequently, managers struggle to have full visibility over whether projects are on track and if deadlines will be met. This is a major pitfall when making decisions and reporting back to the business. 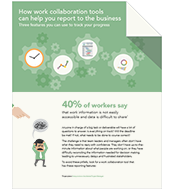 A work collaboration tool can make reporting much more efficient, providing insight into team workload, overview of work progress and transparent stakeholder reports.